Have you ever reached the BBQ breaking point? It’s that summer moment where you just can’t fathom eating another piece of steak, pork or chicken from the grill. No? Don’t agree? Maybe I finally reached that point because grilling isn’t seasonal in this house. There could be three feet of snow on the ground but there’s always a path cleared to get to the grill. Stevo, on the other hand, could eat a NY strip 7 days a week…..in fact, it’s been his meal of choice for the last 5 out of 7 nights. The good news is that I think he’s finally gotten over his chicken wings kick….which lasted 4 years. Yes, he still grilled himself up two pork tenderloins but I opted for something different. 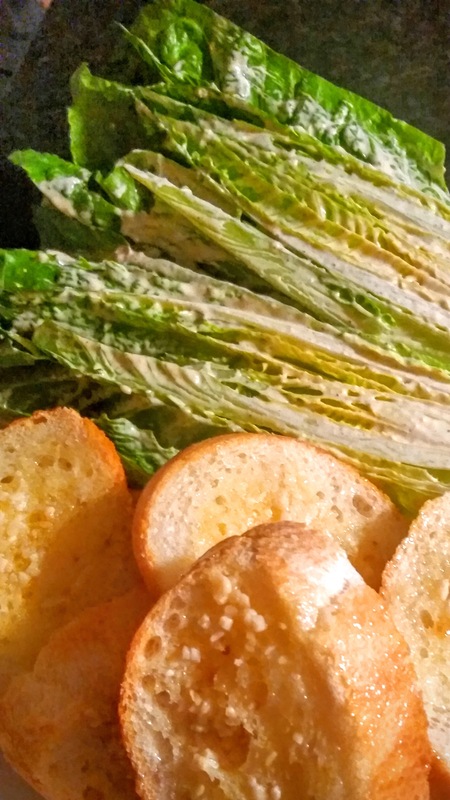 Years ago, I was a waiter in a restaurant that featured table-side Caesar salad. I was barely qualified to be serving water, too young to serve wine and definitely not qualified to be making a Caesar dressing in front of guests. It was incredibly intimidating and I’m sure the concoction I made tasted awful. Smashing the anchovies in the bottom of a wooden bowl, mixing in the egg yolks? Gross. Thankfully, I’ve somewhat matured, in a culinary sense. Somewhat. The dressing recipe I now turn to still has those funky anchovies but no egg yolk. 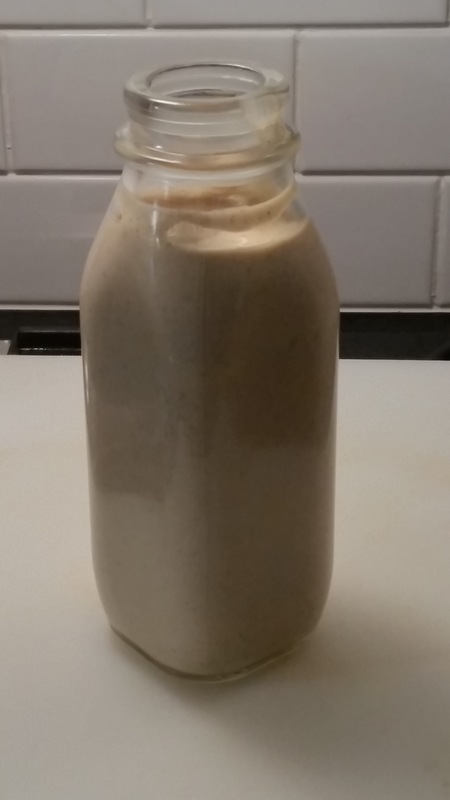 Mayo is emulsified eggs, after all, so you’re instantly guaranteed a smooth, creamy dressing. Everything goes in the blender and then you gradually add the olive oil. (A special thanks to my local organic farm, that sells their half & half in lovely glass bottles…..for a small fortune). Next up is prepping the romaine. 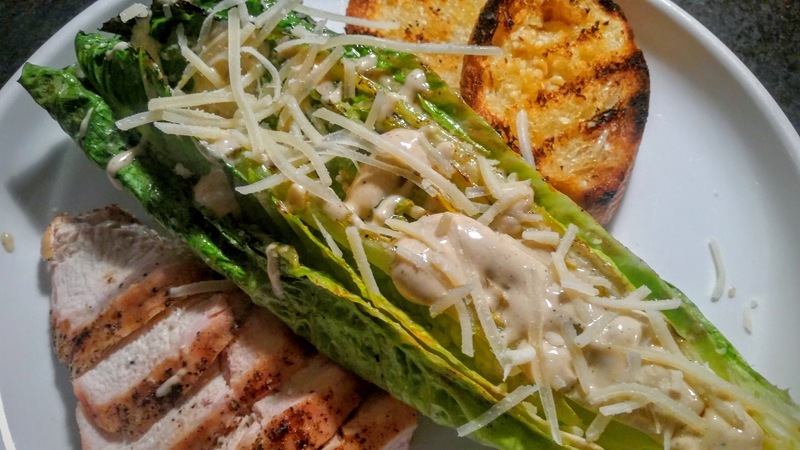 You simply slice the head of lettuce in half so you have a flat surface that will go face down on the grill. 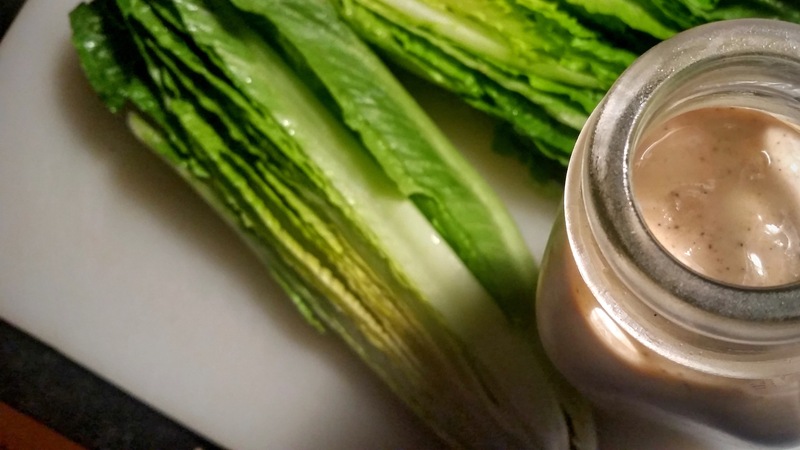 The flat sides of the lettuce get painted with some of the yummy dressing. 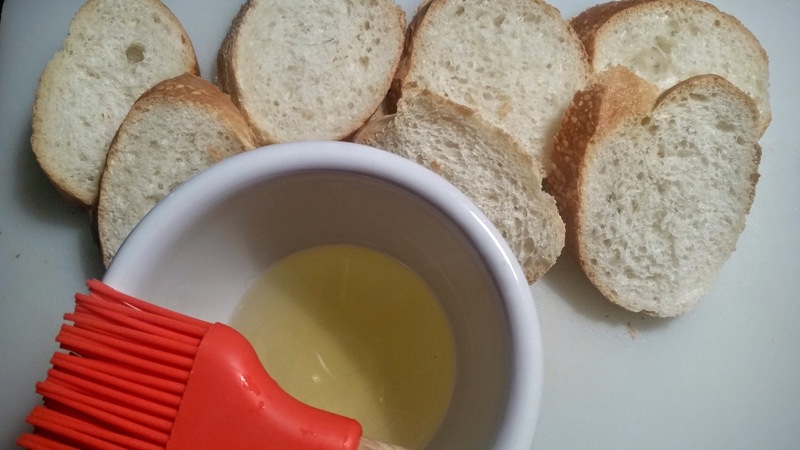 I also sliced up some bread and covered it with olive oil, followed up by melted butter, sea salt and garlic. 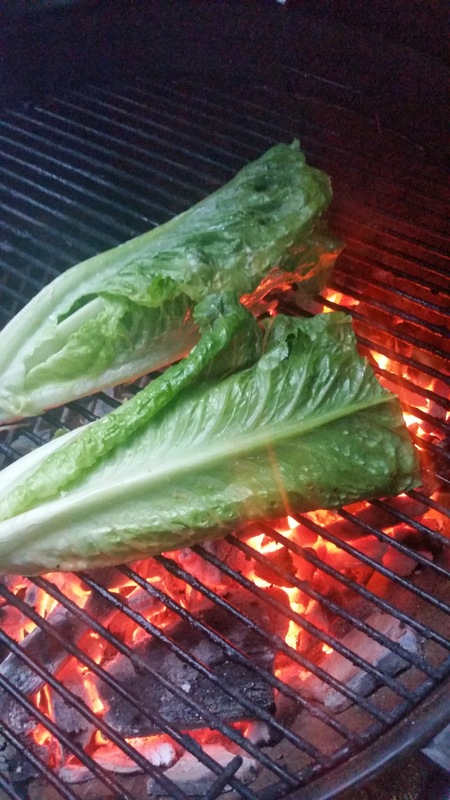 The lettuce is grilled, flat side down, for no longer that a minute. The bread needs a total of 20-30 seconds, each side. Lightly dress the lettuce with the dressing and some parm. You’ll notice I allowed Stephen to grill me a chicken breast…..I guess I can’t escape the ‘BBQ breaking point’, after all. 1. FOR THE DRESSING: Combine lemon juice and garlic in bowl and let stand for 10 minutes. 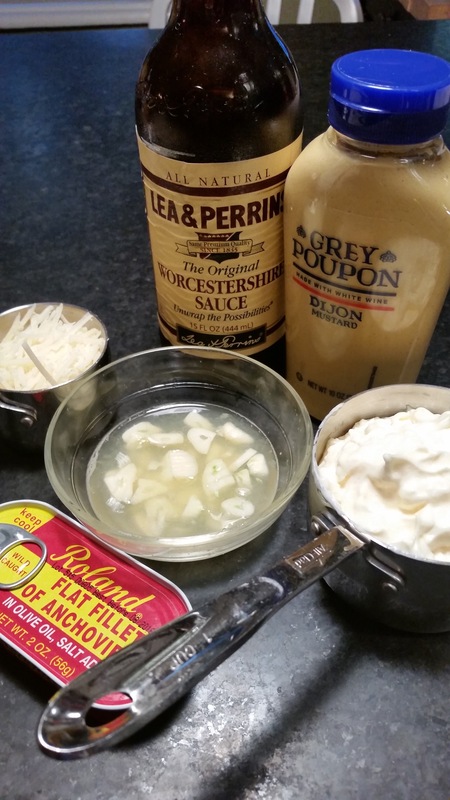 Process mayonnaise, Parmesan, lemon-garlic mixture, vinegar, Worcestershire, mustard, anchovies, salt, and pepper in blender for about 30 seconds. With blender running, slowly add oil. Reserve 6 tablespoons dressing for brushing romaine. 2A. FOR A CHARCOAL GRILL: Open bottom vent completely. Light large chimney starter filled with charcoal briquettes (6 quarts). When top coals are partially covered with ash, pour evenly over half of grill. Set cooking grate in place, cover, and open lid vent completely. Heat grill until hot, about 5 minutes. 2B. FOR A GAS GRILL: Turn all burners to high, cover, and heat grill until hot, about 15 minutes. Leave all burners on high. 3. FOR THE SALAD: Clean and oil cooking grate. Brush bread with oil and grill (over coals if using charcoal), uncovered, until browned, about 1 minute per side. Transfer to platter and rub with garlic clove. 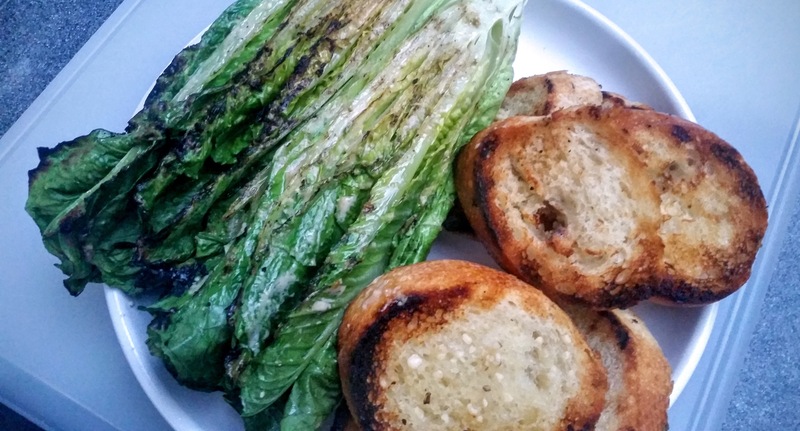 Brush cut sides of romaine with reserved dressing; place half of romaine, cut side down, on grill (over coals if using charcoal). Grill, uncovered, until lightly charred, 1 to 2 minutes. Move to platter with bread. Repeat. 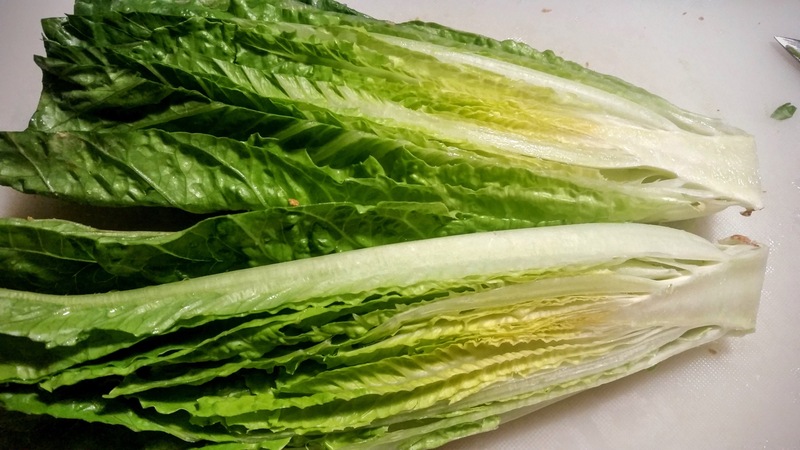 Drizzle romaine with remaining dressing. Sprinkle with Parmesan. Serve. Recipe and grilling method courtesy of Cook’s Kitchen, June / July 2013.